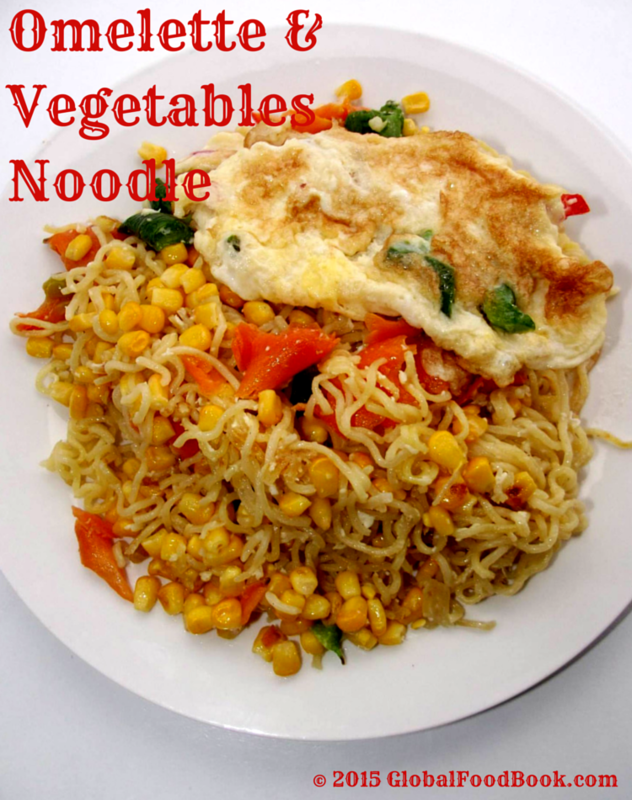 This omelette and vegetables noodle recipe is a comfort-zone one – a big plate of the dish can make anyone super happy! Although I don't usually eat noodles that often, but I am always super excited anytime I prepare it. Ask me why???? Well, due to its unique taste and distinguishable appearance. I don't know about you but all I can say is that I love noodles and there's no two ways about it. While I am usually more of a solid main dish kind of person, there are times when a soft and quick meal is just all I need. This is usually the case for me and so I decided it was time to prepare some omelette and vegetables noodles dish. 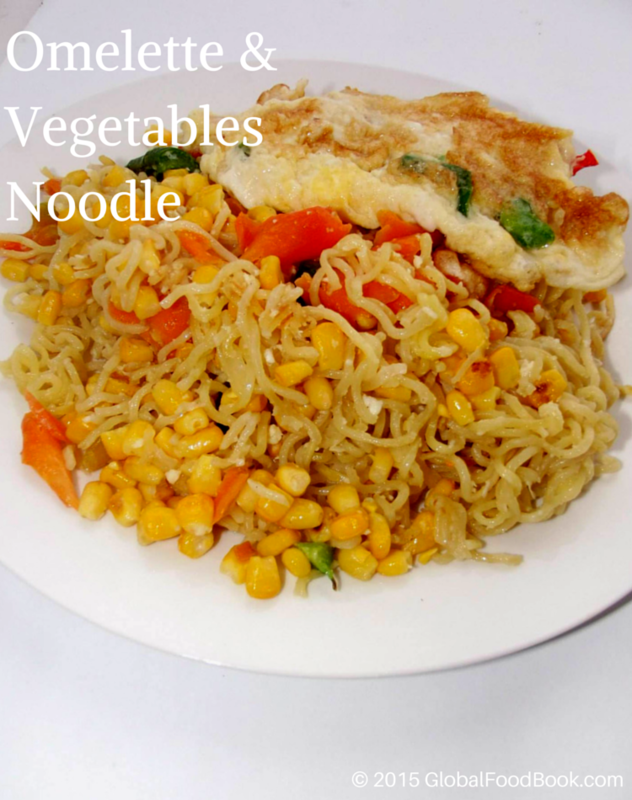 There are various options when it comes to noodles; you can decide to cook it plain or with vegetables or with eggs or a combination of all. But it is worthy to note that noodles can really come out perfectly well exactly the way you can think of. Apart from being an easy and quick meal to prepare, it is also easy on the pocket too----- yes, the ingredients aren't that expensive to come by. You can make variations with the vegetables to whatever you choose; either fresh tomatoes, green beans, green peas, onions, cabbage, parsley etc name them. Believe me, noodles and omelette are a perfect match and you will favour this light noodles packed with sweet corns, carrots and slices of lettuce. If this recipe sounds interesting, why not give it a try now. Add noodles in a clean pot, pour boiling water and simmer for 3 minutes. Bring down from heat, drain water and set aside. Whisk 3 eggs in a bowl, add onions, lettuce and salt to taste. Slightly heat up 1 tsp. vegetable oil in a saucepan, pour in the whisked mixture. Reduce heat and then fry omelette ensuring to turn over the opposite side to fry as well. Bring down from heat and set aside. Add 3 tsps. vegetable oil in a saucepan, stir in onions, sweet corns, carrots and pepper. Continue stirring until the vegetables are slightly dry. 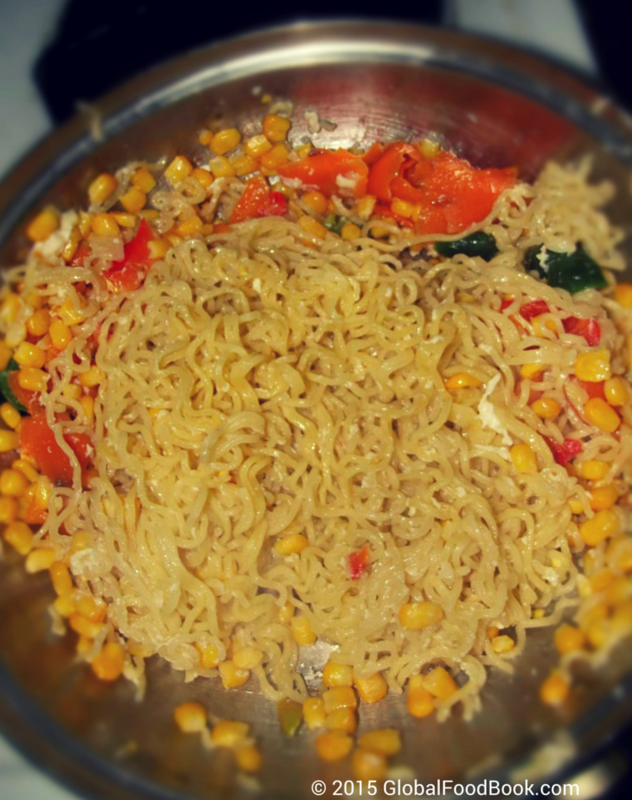 Add the noodles in same saucepan, crack the remaining 1 egg over the mixture, add the noodle mixed spices. Continue stirring all the mixtures together until the egg is cooked and the noodles looking slimy and not sticky. Bring down from heat, garnish with the omelette and serve warm.